Imagine thousands of miles of pipeline carrying crude oil from the prairies of the Dakotas to the wetlands of Louisiana. 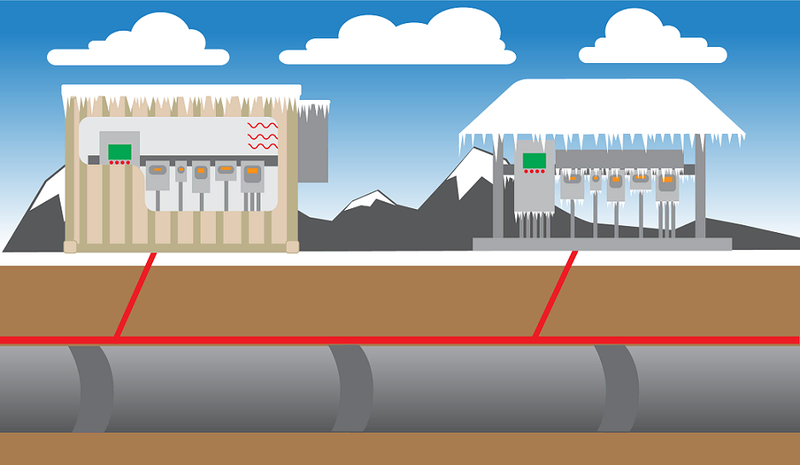 Dotted alongside the pipeline are unmanned monitoring stations called remote terminal units (RTUs). RTUs often go months without attention, but when they do need to be serviced, snow and ice pose a serious challenge. If the RTU has a minimal bus-stop style shelter, the technician will sometimes have to dig the instrumentation out of the snow and chisel off a layer of ice. Skid mounted instrument buildings offer four walls and roof but take months to build and come with a large price tag. Working closely with Energy Transfer, operator of the Dakota Access Pipeline (DAPL) and the Energy Transfer Crude Oil Pipeline (ETCOP), Falcon has developed another excellent use for modified shipping containers: weather tight RTU enclosures. Compare the protection and ease of access offered by a shipping container RTU enclosure (left) versus a bus-stop style RTU shelter (right). Energy Transfer currently uses 317 10-foot shipping container equipment enclosures from North Dakota to the Gulf Coast. Our modified shipping container solution for this midstream oil company helped make the RTUs accessible and secure through two winters with several feet of snow. Each modified shipping container RTU enclosure costs thousands of dollars less than a skid-mounted instrument building, adding up to enormous savings for Energy Transfer. Weather-tight seals. Energy Transfer required our enclosures to be leak-proof even when hosed down with a steady stream of water. Special modifications on the door seals ensure the shipping containers keep the water out. Roofs strong enough for heavy snow loads. Special roof reinforcements ensure enclosure roofs maintain structural integrity even under several feet of snow and ice. Bulkheads for utility pass throughs. Drilling through container walls calls for particular tools, but small variations in the site and the containers makes pre-installing precise openings difficult. Instead, we installed a bulkhead made of thinner metal that an installation technician could drill through on-site without special tools. Falcon Structures' shipping container RTU enclosures are a modular solution for midstream oil and gas companies. In addition to the modifications listed above, the shipping container enclosures included an HVAC system and lighting. The RTU enclosures were a complex build, but our production team was able to produce ten units every eight weeks. For comparison, constructing just one new instrument building can take months. Thanks to a modular design, Energy Transfer can quickly replace RTUs with spare containerized units waiting on stand-by. Shipping container-based RTU enclosures highlight the advantage of modular structures. If the location is difficult to reach, and the structure is repeatable, it just doesn’t make sense to send a construction team to build each unit from the foundation up. Instead, we can do the building where it’s convenient: our quality-controlled manufacturing facility. 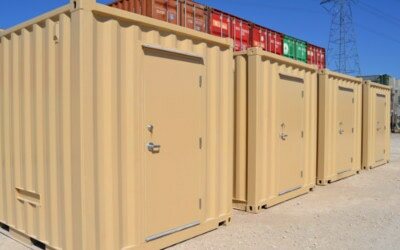 Interested in moving your equipment into a modified shipping container? Our expert sales representatives can answer your questions. Call us at 877-704-0177 or send an email to sales@falconstructures.com.